Turn in assignments in Orange Basket. Laurens District 55 High School will be a school of excellence and equity in educational practices for each learner. 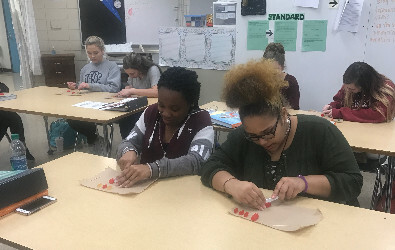 The mission of Laurens District 55 High School is to create a community of learners who are responsible and productive citizens. This course teaches essential concepts and enhance understanding related to plant and animal life including biotechnology, the conservation of natural resources, and the impact of agriculture and natural resource utilization on the environment. The course emphasizes the role of agriculture in our society and the importance of agriculture to the welfare of the world. Basic personal and community leadership, safety, and agricultural mechanical technology are included as a part of the instructional program. 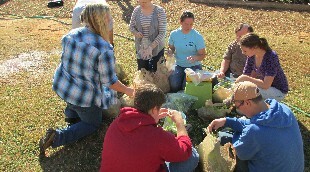 Each student will develop and participate in a Supervised Agricultural Experience. 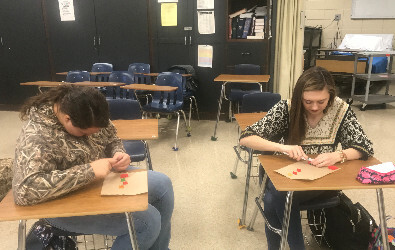 Typical learning activities include hands-on learning experiences such as performing basic principles of plant, soil, and animal science; studying and modeling the significance of humankind’s interrelationship with soil, water, and air; participating in FFA activities. 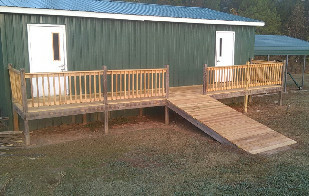 Students will also have the opportunity to learn in a hands-on manner by tending the greenhouse, through working on landscaping projects, and by interacting with small animals. Students signing up for this class should enjoy working outside with plants and animals. Successful completion of this course is required to take upper-level classes in the Plant and Animal Systems Pathway. Understand the importance of agriculture to our society. Regular and prompt class attendance is an essential part of the educational experience. Laurens District 55 High School expects students to exercise good judgment regarding attendance and absences. Students will accept full responsibility for ensuring their work does not suffer because of absences. All students are expected to attend every scheduled class on time. Exceptions may be made for illness and valid emergencies. Be prepared for class each day: inside or outside. Respect your classmates and teacher. Your daily assignments will be on Google classroom or iCEV. You are responsible for turning in assignments on time, even if some assignments have to be done for homework. The required assignments and instructions for each section will be on Google Classroom. If you are absent, be sure to check your Google Classroom for missed assignments. If you complete your assignments on paper, they should be turned in to your class’s basket. If assignments are turned in electronically, then they should be put into your class folder or done on your iCEV. Assessments/tests will be done on the iCEV website. It is YOUR responsibility to come after school or during grade assistance time to catch up on missed work from your absences. I will NOT take class time to help you catch up. Plagiarism is the practice of copying words, sentences, images, or ideas for use in written or oral assessments without giving proper credit to the source. Cheating is defined as the giving or receiving of illegal help on anything that has been determined by the teacher to be an individual effort. Both are considered serious offenses and will significantly affect your course grade. Please refer to the Student Code of Conduct booklet for additional information. A combination of lecture, hands-on projects and labs, presentations, SAE (Portfolio), and cooperative learning will be used in this course. Grades will be determined by the satisfactory and timely completion of assignments inside and outside of class. The grade of each assignment is based on the prerequisite given for each assignment. Below is an overview of topics and major assessments/assignments for this course. Please note dates/timeframes are subject to change and are an estimate. Safety during this class is extremely important. Please follow all safety rules in order to keep yourself and the animals we will work with safe at all times. Especially pay attention to your environment when we are outside and in the shop. If you are having trouble with this class, come to me immediately, and I can work with you. If you wait until the end of the 9 weeks, it will be TOO LATE. I will be available to help you understand so you can be successful in this class. ______________I have read the information and I fully understand what I’m expected to do in class. Small Animal Care Grade: 10, 11, 12 – 1 Unit Prerequisite: Agricultural Science and Technology This course is designed to teach technical knowledge and skills for occupations in the pet industry or the companion animal industry. Skills also relate to the veterinarian or the veterinarian technician career field. 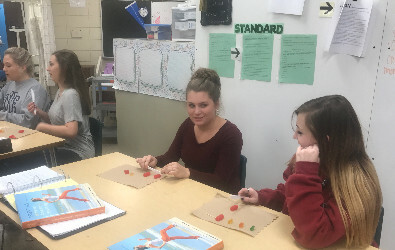 Typical instructional activities include hands-on experiences with cats, dogs, rabbits, and fish, etc. and participating in personal and community leadership development activities. Students will plan a relevant school to work transition experience. 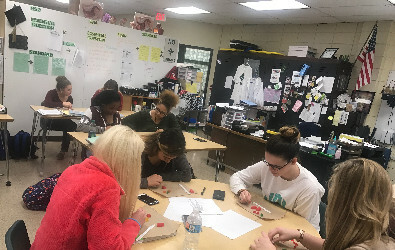 Students may complete labs and hands-on activities off-campus. 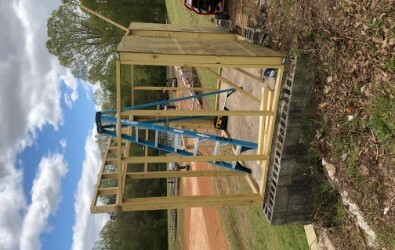 Students will carry out labs and hands-on activities at the school’s outdoor animal area or local farms. You should have at least a C in this class to move to the next upper class or be approved by the teacher. Your daily assignments will be on Google classroom or iCEV. You are responsible for turning in assignments on time even if some assignments have to be done for homework. The required assignments and instructions for each section will be on Google Classroom. If you are absent be sure to check your Google classroom for missed assignments. If you complete your assignments on paper they should be turned into your class’s basket. If assignments are turned in electronically then it should be put into your class folder or done on your iCEV. Assessments/test will be done on the iCEV website. A combination of lecture, hands-on projects and labs, presentations, and cooperative learning will be used in this course. Grades will be determined by the satisfactory and timely completion of assignments inside and outside of class. The grade of each assignment is based on the prerequisite given for each assignment. If you are having trouble with this class, come to me immediately and I can work with you. If you wait till the end of the 9-weeks, it will be TOO LATE. I will be available to help you understand so you can be successful in this class. Prerequisite: Agricultural Science and Technology or Introduction to Horticulture plus two additional upper-level Agriculture or Horticulture courses and approval by teacher. ● Learn to safely work within the Agriculture Industry. ● Learn the skills needed to be successful in an area within the Agriculture industry. Regular and prompt class attendance is an essential part of the educational experience. Laurens District 55 High School expects students to exercise good judgment regarding attendance and absences. Students will accept full responsibility for ensuring their work does not suffer because of absences. All students are expected to attend every scheduled class on time. Exceptions maybe made for illness and valid emergencies. Each student will be given the opportunity to either do a Co-op or complete a certification program. Your daily assignments will be on Google classroom or iCEV if you are on-campus. If you are working off –campus you will be expected to contact me and your worksite if you are absent. You are responsible for turning in assignments on time even if some assignments have to be done for homework. 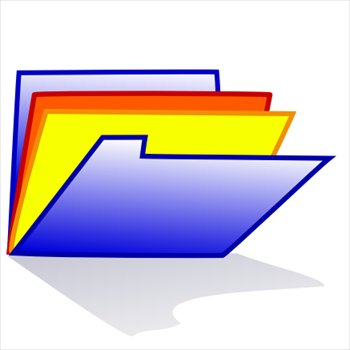 If assignments are turned in electronically then it should be put into your class folder or done on your iCEV. Assessments/test will be done on the iCEV website. 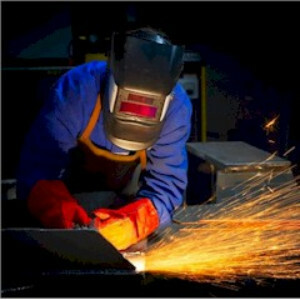 This class will use a combination hands-on projects, Co-op experiences, and iCEV assignments. Grades will be determined by the satisfactory and timely completion of assignments inside and outside of class. The grade of each assignment is based on the prerequisite given for each assignment. 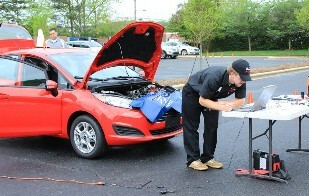 Ford/AAA Student skills contest that was held in Charlotte April 18 and 19, 2015. 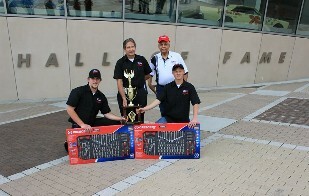 We won the state and will compete in the national in June. Building the future one student at a time. 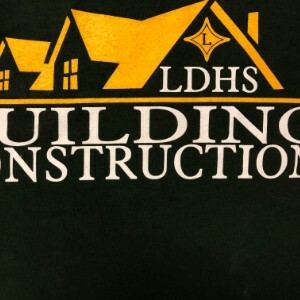 Here at LDHS we pride ourselves in community out reach. 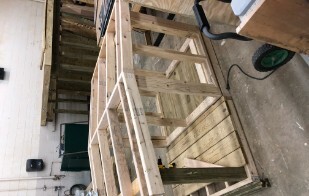 The Building Construction department has performed several project for our great Laurens community include decks, ramps, remodels, and event projects for our City Hall. The students that are evolved in the program at Laurens are making improvements on campus and in our community as the strive for the more life has to offer. These student make the difference and reach for success on a daily basis. Getting to work out in the community is most rewarding. The feeling of finishing a project after all the hard work that has gone into it. 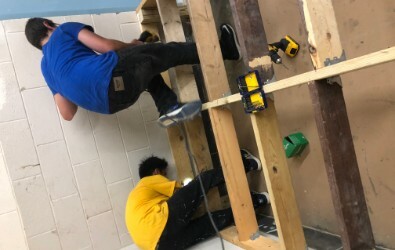 Building projects is what I enjoy most about Building Construction class. Building Construction to mean helps students build their future and helps teach them more about responsibility. I wake with a mission daily to sow into the lives of the individual students here at Laurens, more than just to teach but to inspire. The mission I have set for the Building Construction program is to sow bountifully, and reap bountifully by teaching students that they must work for what they want in life and that nothing will be handed to them. What students put into the program is what they will get out nothing more nothing less, this is life and that is what teaching is all about not just math, English, or CATE but teaching life along the way to create better men and women.